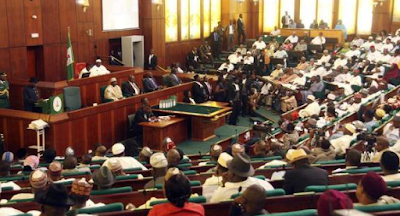 Plenary of House of Representatives on Thursday was rowdy as members disagreed over the propriety of the one billion dollars sought by President Muhammadu Buhari to fight Boko Haram insurgency. The confusion followed a motion by Rep. Ken Chikere (Rivers-PDP) on the “Need to deduct 13 per cent Derivation from the one billion dollars approved by the National Economic Council (NEC) to fight Boko Haram Insurgency”. Moving the motion, Chikere said that if 13 per cent derivation was not deducted from the one billion dollars and paid to oil-producing states, it would amount to double contribution by the states. He added that it would also be a breach of section 16 (2) of the 1999 Constitution and Section 1 of the Allocation of Revenue (Federation Account, etc) Act, Cap.A15, Laws of the Federation of Nigeria, 2014. “At the 83rd meeting of NEC held in the Presidential Villa, Abuja, on Dec. 14, 2017, the 36 states’ governors approved the deduction of one billion dollars by Federal Government from Excess Crude Account (ECA) to fight Boko Haram. “The proviso to Section 162 of 1999 Constitution states that 13 per cent of proceeds of oil-producing states as derivation funds payable to benefiting states of Akwa-Ibom, Rivers, Delta, Bayelsa, Cross River, Edo, Abia, Imo, Ondo, Anambra and Lagos. “That 13 per cent derivation fund payable to oil-producing states had not been deducted and paid to them from the one billion dollars before or after the approval of the said sum to fight Boko Haram insurgency. “Concerned that if the 13 per cent derivation fund is not deducted from the one billion dollars and paid to oil-producing states, it would amount to double contribution from the said states. ” It will also a breach of section 16 (2) of the 1999 Constitution and Section 1 of the Allocation of Revenue (Federation Account, etc) Act, Cap.A15, Laws of the Federation of Nigeria, 2014,” Chikere said. He urged Federal Ministry of Finance to ensure that amount representing 13 per cent of one billion dollars approved by NEC to fight Boko Haram was deducted and paid to oil-producing states. He said that the payment would be in compliance with Section 162 (2) of the 1999 Constitution. The lawmaker urged his colleagues to mandate the Committees of Finance and Legislative Compliance to ensure compliance. He added that “the amount involved is arguably a large sum of money but no sum of money is too large for security. I urge us to show resolve by supporting this motion’’. But, Rep. Shehu Garba (Kaduna-APC) opposed the motion, saying that the fight against Boko Haram insurgency should be seen as a national challenge than a sectional issue. He said that debating the issue would open up “a Pandora box” that may apparently heat up the polity. He said, “We do understand the reason behind this motion. However, I do have a different perspective. The basic question is whether Boko Haram is a regional challenge or national challenge. “We must accept that just as you as a person will not have a good night sleep when you have pain. “You must accept that any challenge in any part of Nigeria is a challenge for everyone. Boko Haram challenge is a national challenge. Recognised by the Speaker, Mr Yakubu Dogara, a member, Rep. Henry Archibong (Akwa Ibom-PDP) raised a Point-of-Order. The lawmaker said “point-of-order, no money shall be withdrawn from the consolidated revenue funds. Similarly, Rep. Aliyu Patigi (Kwara-APC) said that the issue at stake was of mathematical nature. “It is an accounting issue. It is an issue that relates to the Federation Account. In his contribution, the Deputy Speaker, Mr Yussuf Lasun, said that it was necessary to understand the difference between the Federation and Consolidated Accounts before deliberating on the matter. “I think this motion is very important because of so many parts of the country it is touching. Whatever touches Boko Haram, let’s deal with it because we have suffered negatively from Boko Haram. It is a pure constitutional matter. In his remarks, the speaker reminded the House that the entirety of the money coming from the ECA had been approved by the State Houses of Assembly, allowing their respective governors to give consent to the request. He wondered whether the National Assembly had any significant input in the matter. He ruled that the motion be stepped down until the state of the Excess Crude Account was ascertained.